You could be vitamin B12 deficient! Vitamin B12 deficiency is increasing at an alarming rate in India, with almost 60-70% of Indians suffering from it. Vitamin B12 or Cobalamin plays a key role in the formation of blood and normal functioning of the nervous system. 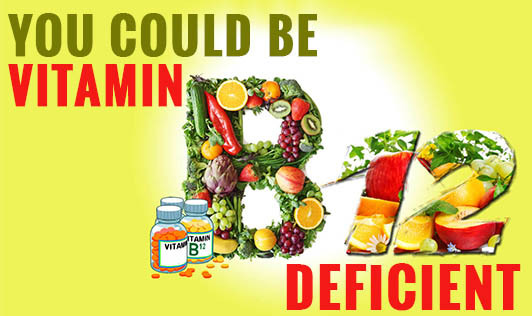 Its deficiency can cause serious health issues like anemia, cognitive decline and neural tube defects in unborn babies and therefore it is important to detect and treat vitamin B12 deficiency in time. Who is at risk of this deficiency? • People suffering from Crohn's disease, ulcerative colitis, celiac or irritable bowel syndrome. How do you treat this deficiency? Eating large amounts of vitamin B12 rich foods like milk and milk products, red meat, whole grain cereals, fish, shellfish, liver and eggs is the best way to prevent B12 deficiency. However, there are not many food options for vegetarians and they should consider supplementing themselves with B12 supplements after taking their doctor's advice. The next time you feel tired and irritated; get yourself tested for B12 deficiency.